Enhancing transparency and control for Office 365 customers (April 21): New security features that aren’t in Office 365 yet, but will be over the next year or so. This was an announcement for the RSA conference, but contained some nuggets that affected chapters 2 and 17. Evolving Data Loss Prevention in SharePoint Online/OneDrive for Business and Office applications (April 21): Thankfully we knew all about this stuff because we were on the preview program, so DLP for SharePoint and OneDrive for Business is covered in chapter 16. Enhanced non-delivery reports (NDRs) in Office 365 (April 17): A really nice enhancement that isn’t available yet, so our mail flow chapter (11) survived. Office 365 Video begins worldwide rollout and gets mobile (April 16): Video has been available to First Release tenants for a while and we had it well covered in chapter 18, but a number of new details came to light when Video achieved general availability. Office 365 now supports larger email messages—up to 150 MB (April 15): This was an easy detail to insert into chapter 6. I’ve also commented on the topic on WindowsITPro.com. New Office Delve People Experiences in Office 365 (April 14): This update arrived just before we stopped writing, but it caused some issues because Delve now boasted a new user interface. So we had to get screen shots to insert into chapter 18 as well as check out the new information to make sure that our text was still accurate. Other stuff has happened to affect the content of the book, but the detail above is enough to give you the picture of the dynamic environment found inside Office 365 and the difficulty often found when writing about cloud services. Every day we have been scanning headlines and our inboxes to figure out what’s happening inside Office 365 so that we can adjust as required. Fortunately, because we are creating an eBook, we can update text much more easily and faster than we would be able to do for a traditional printed book. At least, we can in the Word documents that we have for each chapter and the overall book file. Word does a good job of generating PDFs, so that part is handled quickly. The fun starts when it comes to generating files in the format used by mobile book readers. We’re focusing on EPUB for the start as this is a free and open format supported by many readers. We might then look at other eBook formats, including Kindle. The route from Word to PUB is via the Caliber eBook generator. This decision leverages the experience of Paul Cunningham, who has generated quite a few eBooks for his exchangeserverpro.com site. 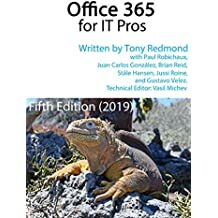 However, Office 365 for Exchange Professionals is both larger (18 chapters, 1 appendix, 630 pages, 240,000+ words) and more complex in terms of styles and formatting than Paul’s previous books, so we are running into a couple of interesting challenges. Based on some recommendations, we looked at using Adobe InDesign to format the Word content for publication. InDesign is used by many professional designers and layout specialists to prepare files for publication. This is especially important when dealing with printers because the RGB colors used for screens need to be translated into the CYMK palette used by printers. InDesign does all of this when it outputs files for printers. Adobe offers a 30-day free trial to see whether InDesign is for you. There’s no doubt that InDesign is a powerful layout and formatting program for many types of documents but using that power requires a steep learning curve. I have been using various forms of text editors and layout tools since the early 1980s, including VAX Document (think TeX for VAX) and DECwrite, which InDesign reminded me of a lot. DECwrite was a “Compound Document Architecture” WYSIWYG editor that ran under the DECwindows windowing system on VAXstations in the 1989-1994 period. I used it to create my ALL-IN-1 books and generally enjoyed the powerful formatting capabilities that were built into DECwrite, even if the program was prone to crashes (thankfully, its ability to recover work was excellent). In any case, two days of dedicated trial and error plus lots of Internet searches and sitting through a number of video tutorials got me to the point where I could import the book from Word in a reasonably efficient manner and generate an EPUB file. The imported content needed a fair amount of fix-up beforehand to make sure that graphics were in the right place and that the flow looked good, but I got there. Many of the problems originated in the source Word documents and needed to be fixed there to ensure that any future import would work smoothly. But the output I generated was inferior to what Paul is able to create with Caliber, so seeing that we do not need to create files for printing, we decided to revert to Plan A and go with Caliber, which is how we are currently proceeding. When we have everything done, I’ll publish another post to give some advice of how to format and fix Word documents if you are interested in publishing technical books along this route. It might interest some! This entry was posted in Cloud, Exchange, Office 365 and tagged Adobe InDesign, Caliber eBook, eBook, EPUB, Kindle, Microsoft Ignite, MOBI, Office 365, Office 365 for Exchange Professionals. Bookmark the permalink. Just pre-ordered the Ebook – looking forward. Thanks Tony and Paul.